– What do we understand by ‘better’ mental health services? – Do we need mental health services at all? If so, what should they look like? If not, what other ways are there? – The politics of changing mental health services. Oor Mad History: a group of people with lived experience/mad identified, mad positive academics and mental health advocacy workers from Edinburgh, Scotland, interested in the newly emerging field of “Mad Studies”. Jim van Os: Professor of Psychiatry at Utrecht Medical Centre (UMC), The Netherlands, interested and active in mental health care reform. Diana Rose: Mental health service user throughout her adult life and now Professor of User-Led Research at King’s College London, researching mental health services from the perspective of those with mental distress who use such services. Jolijn Santegoeds: Service user/survivor of psychiatry, and founder of a protest group in the Netherlands called “Rage against Isolation!”. Paul Doherty: CEO at Slí Eile, which supports people to develop a strong foundation for mental health recovery by harnessing the power of intentional residential community, collective enterprise and discovery-based life-planning. Jay Watts: consultant clinical psychologist, psychotherapist and activist, who has written widely about neoliberalism and the politics around mental health. Concurrent Sessions: there will be workshops and oral presentations, related to the conference theme. Call for Oral Presentations/Workshops (45 minutes’ duration) extended to 29 September: Submit an abstract (in Word – 250 words max) related to the conference theme, outlining its aims and intentions and a brief bio (in Word – 150 words max). Email abstract and bio to l.sapouna@ucc.ie. Full programme: Full details will be available in mid October on http://www.ucc.ie/en/nursingmidwifery/news/ and http://www.ucc.ie/en/appsoc/resconf/conf/. Check http://www.uccconferencing.ie/walking-distance/ for accommodation. To get to Brookfield (UCC) check http://www.ucc.ie/en/visitors/getting-here/ Parking facilities are limited around UCC. Try car park next to Kingsley Hotel, Victoria Cross (10 walk from venue via footbridge behind Western Gateway Building on Western Road). Coffees and lunches not included. There are restaurants and cafes in and around the conference venue. Venue: Brookfield Health Sciences Complex, University College Cork, Ireland. Booking: Email Harry Gijbels h.gijbels@ucc.ie and make sure you give your name, and indicate the day(s) you wish to attend (either Wednesday 15 November, Thursday 16 November, or both days). Booking will be confirmed by return email. Please bring the booking confirmation slip with you to the conference registration desk on the day(s) you are attending. Irish Institute of Mental Health Nursing Conference 2017 will take place on May 18th and 19th 2017 in the School of Nursing, Midwifery and Health Systems, UCD. The theme this year is “Collaborative Relationships-Challenges/Opportunities for Mental Health Nursing”. Confirmed keynote speakers are Eithne Cusack, Rufus May, Elisabeth Svanholmer, Rory Doody, Francis Walsh, Margaret Duggan and Adrienne Adams. The conference will also feature the return of the Hypothetical Debate and the Launch of the IIMHN Position Paper on Trauma Informed Care. Abstracts are invited from all groups on areas related to the conference theme. The closing date for abstract submission is 13th April 2017. Guidelines for abstracts for concurrent papers and posters are here and the requirements for poster presentations are here. Mental Health Nursing students are especially welcome and there will be a student competition category for posters on the day. 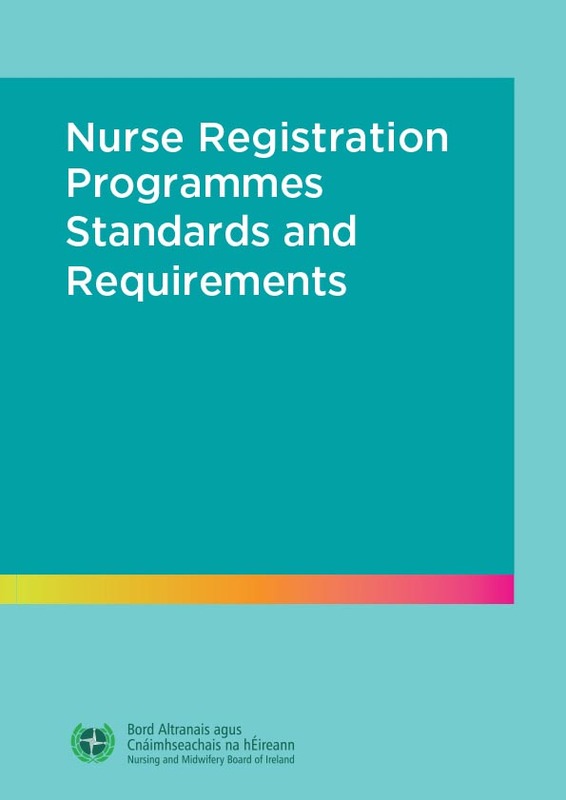 The Nursing and Midwifery Board of Ireland (NMBI), launched two new Standards and Requirements Document to support the education of nurses and midwives in Ireland on Tuesday 09.02.2016. The revised Standards and Requirements are designed to support the continuous development of professional undergraduate education programmes in Ireland. You can download the nursing document from here.